Is that a mouthful or what? A very tasty mouthful if I say so myself. We’re looking at tender, coconut cake pieces soaking in a simply strawberry chia sauce and covered in layers of coconut whipped cream. 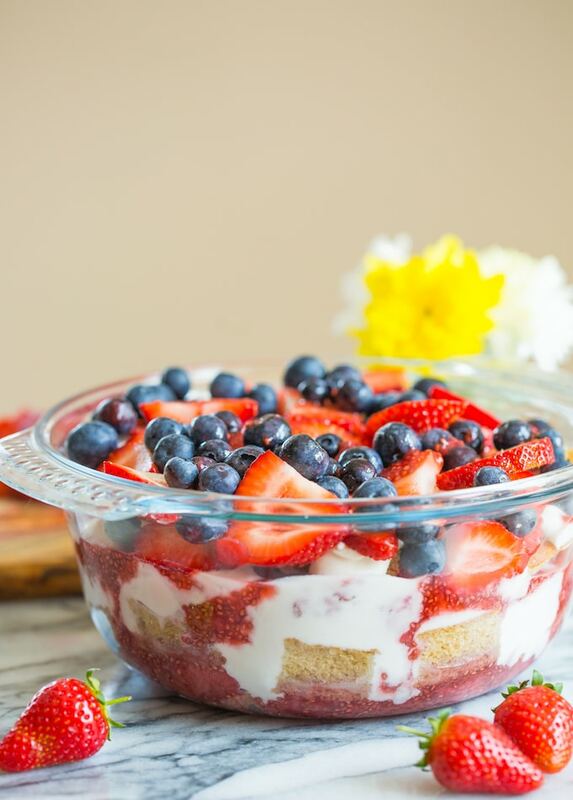 And then topped with more berries because why the hell not? It’s messy yet impressive and it’s kind of the perfect party dessert for spring and summer get togethers. The cake portion of this trifle is basically just the coconut flour cake I shared earlier this week but baked in a square tin. 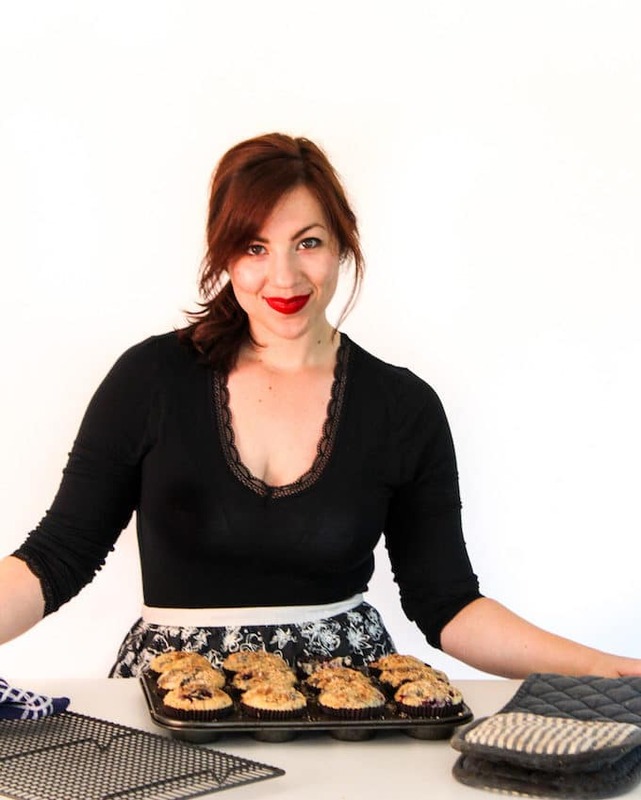 It’s a real no-brainer to make: just whisk together the wet ingredients, stir in the dry and then bake at 350. It’s nut, dairy and grain free which makes this a great base cake if you plan on serving this a crowd or friends with food allergies. You can make the cake portion of this recipe a day or two in advance to speed up the assembly process. Store covered in the fridge until you’re ready to go. The sauce comes together in about 20 minutes or less with just four ingredients: strawberries, sweetener, vanilla and chia seeds. Add the first three ingredients to a pot and then heat on the stove top until the berries are broken up and simmer. Stir in the chia seeds to help thicken the sauce, cook for another few minutes and that’s it! Set aside until completely cooled before assembling. Just like the cake the sauce can be made a few days in advance. Store in a sealed, airtight container in the fridge. Make sure you remember to refrigerate your coconut milk before using – especially if you live in a warm place. You need the coconut cream to solidify in the can and separate from the coconut water to make this. When you’re ready just scoop out the solid cream and add it to a bowl to mix. You can whip up the coconut cream as is but you may want to add a little bit of sweetener depending on your tastes. Once you’ve got everything prepared and cooled it’s just a matter of putting it all together. While it might take a little time to put it all together the individual components themselves aren’t too difficult. It’s all made even easier it want to prep things in advance so that you can have it ready in a moments notice. 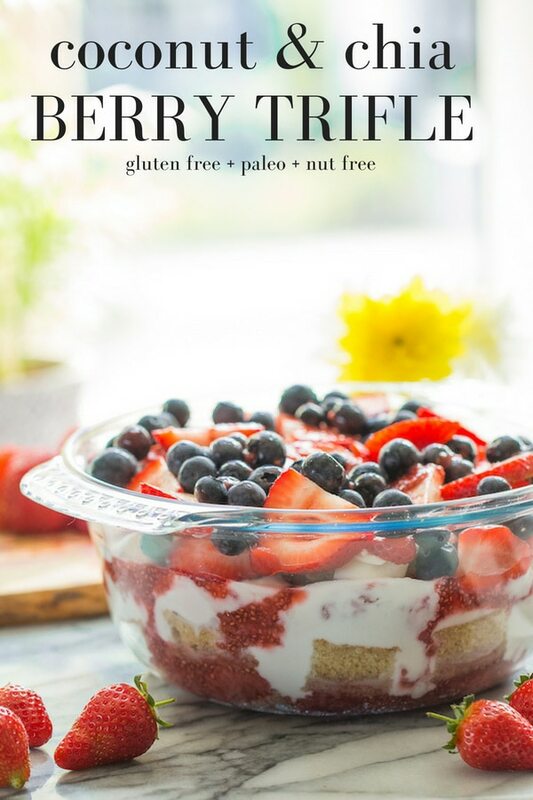 Don’t forget to #asaucykitchen on instagram if you try this Paleo Summer Berry Coconut Trifle. I love seeing what you make! You can also post your pictures to my facebook page! Preheat your oven to 350°F/180°C. Grease or line an 8x8 inch square baking tin. Set aside. Beat the eggs in a medium sized bowl. Add the vanilla, the honey (or maple syrup), oil and vinegar to the eggs. Mix thoroughly. Add in the coconut flour, tapioca flour and baking soda. Whisk to combine. Pour the batter into your prepared cake tin. Smooth over so it's evenly spread in the pan. Place in the bottom third of the oven and bake for 25-28 minutes or until cooked in the centre. To check for doneness prick the centre of the cake with a knife or toothpick - if it comes out clean it's done. While the cake is baking begin working on the sauce. Carefully remove the cake from the tin and transfer to cool on a wire cooling rack. When the cake is completely cooled cut it up into 1 inch cubes. Add the strawberries, honey or maple syrup and vanilla to a medium sauce pot and heat on a medium low temperature. Simmer for about 10 minutes. Stir every few minutes and gently mash up the strawberries as they cook. Stir in the chia seeds and cook for another 5 or so minutes until the sauce begins to thicken slightly. Remove the pot from the heat and set aside to cool completely before you begin assembling the trifle. To speed up cooling time transfer the sauce to another bowl. Carefully scoop out the solid cream and place in a metal or glass mixing bowl (something cold) and try your best not to get any of the water. Beat the coconut cream on a medium to high speed for a couple of minutes until it becomes whipped and airy. Taste the whipped cream to decide on whether or not you want to add a little sweetener. Whip for another minute to fully incorporate the sweetener if you added any. This trifle is made up of 2 layers cake, 2 layers sauce, and 2 layers coconut whipped cream. Start but adding half of the berry sauce to the bottom of the trifle dish or glass bowl. Top with half the cubed cake pieces and then half the coconut cream. 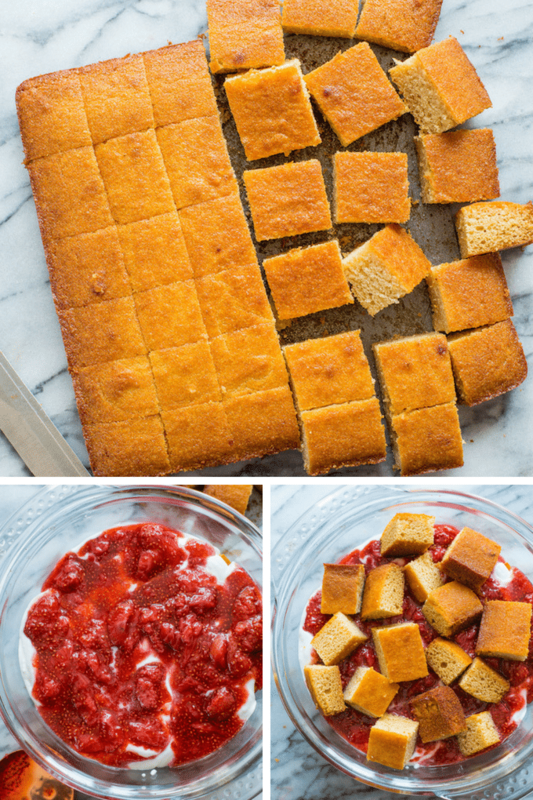 Repeat those layers once more then top with the remaining berries. Cover loosely and store in the fridge until ready to serve. Leftovers can be kept up to 4 days. I recommend refrigerating your coconut milk cans overnight so that the coconut cream hardens and separates easily from the water to make the whipped cream. I would love to make this dessert. What can I sub for the eggs as I have a high intolence for eggs? 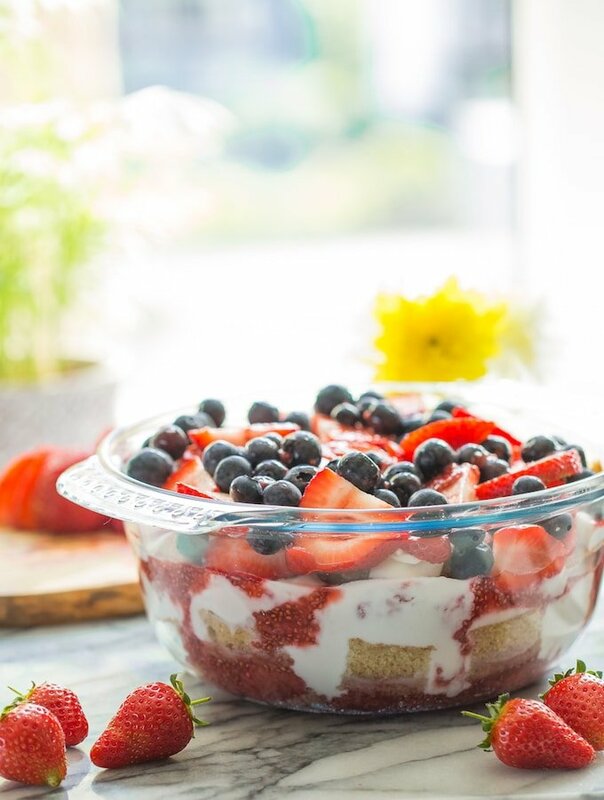 This trifle looks and sounds perfect for summer parties! So delicious and colorful!